Kahawa Safi’s French Press delivers your perfect coffee experience, just like the professional baristas. Whether you’re entertaining friends or family, crafting a single cup of coffee for yourself, or sending as a gift to loved ones, we guarantee our French Press will deliver an excellent, pure, cup of coffee. EXCELLENT QUALITY: OUR French Presses contain the highest quality materials and internal working parts. 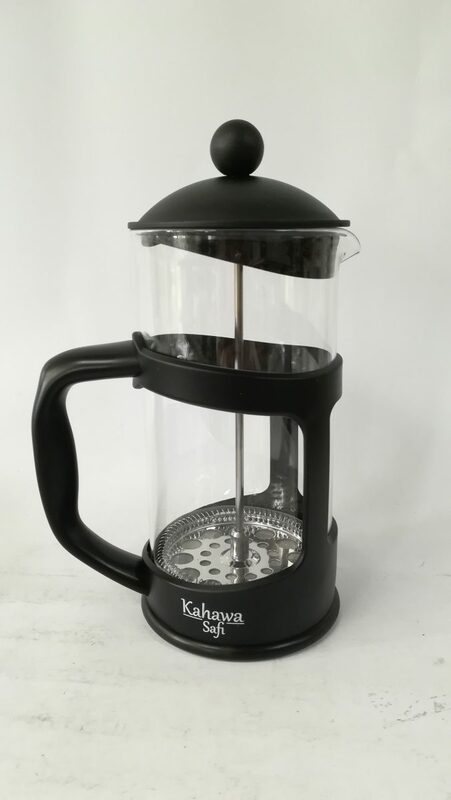 Our thermal shock resistant borosilicate glass carafe, 18/8 stainless steel gaskets and plunger, BPA-free plastic, commercial grade filter screen, 16 ounce water marking, and unique screw design, is what separates Kahawa Safi from the rest. MULTI-FUNCTIONAL: Your Kahawa Safi French Press can be used for many other applications other than pressing a cup of coffee or tea. Did you know you can also use this to juice fresh berries (raspberries, blueberries, blackberries, strawberries, etc. ), rinse quinoa, rehydrate dried foods, and strain the liquid off frozen vegetables such as spinach? Simply exchange the included extra filter screen for other uses. 34oz (1000 ml) is the perfect size for any occasion. HASSLE FREE PURCHASE: We stand behind our products with our Unconditional Satisfaction Guarantee and Lifetime Warranty. If you are not 100% satisfied, please CONTACT US immediately.